Detroit Tigers: Will Omar Infante Compete for Center Field Job? Veteran infielder Omar Infante is now in his third stint with the Detroit Tigers organization. The veteran infielder is reportedly hoping to get a look in center field. Last December, the Detroit Tigers signed Omar Infante to a minor league deal. Infante, now 35 years old, has had two previous stints with the Tigers. Infante came up with the Tigers in 2002 and spent the first six seasons of his career in the organization. During his first stint with the Tigers, Infante was part of a team that set an American League record for losses in 2003. Three years later, he was part of a team that went to the World Series. Though he played in 142 games and hit a very respectable .264/.317/.449 (102 OPS+) with 16 home runs in 2004, he spent a good amount of time as a utility player. After the 2007 season, Infante was traded to the Chicago Cubs, who then flipped him to the Atlanta Braves. Infante went on to have a successful three-year run with the Braves, slashing .309/.353/.411 (105 OPS+) across 1,083 plate appearances. He also made an All-Star team in 2010. Following the 2010 season, Infante was traded to the Miami Marlins (then the Florida Marlins) in the Dan Uggla deal. He spent a season-and-a-half with the Fish before being reacquired by the Tigers along with starting pitcher Anibal Sanchez in the summer of 2012. For the remainder of the 2012 season, Infante stabilized the second base position for the Tigers. In October, he found himself playing in his second World Series with the club. The following season, Infante missed a considerable amount of time after being injured by a Colby Rasmus takeout slide in July. However, he still had one of the best seasons of his career. Through 118 games, Infante hit .318/.345/.450 (115 OPS+) with 10 home runs. Following the 2013 season, Infante became a free agent. 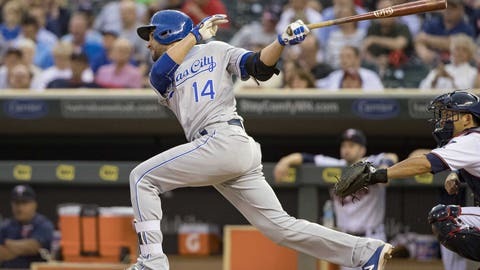 After the Tigers acquired Ian Kinsler from the Texas Rangers, Infante signed a four-year deal with the Kansas City Royals. During his time with the Royals, Infante’s production dipped and he was released in the third year of his deal. He signed a minor league deal with the Braves, who later released him as well. Now in the Tigers organization for a third time, Infante is hoping to get a look in center field this spring, according to the Detroit Free Press. Obviously, Kinsler, who continues to provide All-Star-caliber production, remains at second base for the Tigers. Center field would clearly be a better route to playing time for Infante. The Tigers are still looking for a center field solution after dealing Cameron Maybin to the Los Angeles Angels. Other contenders for the position currently include Mikie Mahtook and Tyler Collins. Infante’s name would be added to the list of those who might be facing longer odds, such as JaCoby Jones, Anthony Gose and David Lough. Next: Will Arenado Win First MVP Award in 2017? Although he has primarily been an infielder, Infante has logged a total of 101 games in the outfield throughout his career. Infante has now been part of four World Series teams, including the 2015 world champion Royals. It will be interesting to see if he can crack the Tigers’ 25-man roster.